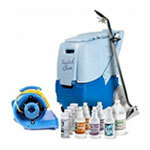 This Trusted Clean 5 gallon carpet extractor works great as an addition to your mobile auto detailing operation. Lightweight and portable at just 57 pounds you can take it just about anywhere. And you don't have to worry about finding 2 separate circuits for this machine; the vacuum motor and heater run off one power cord. This is very convenient if you're in a remote location and only have access to one outlet. This 5 gallon heated carpet extractor comes with a generous 15 foot vacuum/solution hose and a stainless steel upholstery tool. You can also use it for carpet cleaning jobs by attaching an optional carpet cleaning wand. If you're looking for a slightly larger machine make sure to check out our whole line up of heated carpet extractors, as well as our unheated carpet cleaning machines. We also have the handy Trusted Clean Comparison Chart to help you decide which Trusted Clean machine is right for you. "No drip" motor cavity guarantees water spilled on outside of machine stays out! Opens quickly like a clamshell for fast and easy servicing. Upright-mounted motors along with a special inter-cooler guarantee long life and durability. Full complement of accessories attaches to the back of unit for cleaning upholstery, stairs, etc. Silencer system ensures a quieter operation. Handle folds down for easy transport and compact storage. Lifetime warranty on tanks & heating element, 2 years on parts and labor. Machine is being used as an auto detailing machine, with some light upholstery and small amount of carpet cleaning. What's good about it: Very good suction, heats water well, sufficient water output. Portable and lightweight. Overall the performance is very good with no complaints in the quality of cleaning ability. What's not so good about it: Handle folds for storage or transport, but is only held in place by small clips on each side, which when you try to push or pull it you have to be careful because it feels like you're going to break the handle off. Height of drain is not taller than a bucket, so you still have to tilt your bucket, and it doesn't drain fully unless you tip the machine sideways (which is hard when holding a tilted bucket). Switches are hard to get to because everything is in the way...heater, solution hose and electrical cord coming from the heater (which plugs in below where you drain the water). Overall this is a good performing machine if you can be content with some of the inconveniences, however I feel there are better options available. If I had to do it over again, I would buy the Trusted Clean that is one size larger with the switches on the top, hopefully the drain valve would be bucket height and allow for the full tank to drain without tipping the machine, but I'm not sure if that's the case with the larger unit. I would highly recommend Clean Freak for their excellent customer service, super fast shipping, careful packaging of equipment, and outstanding value for the high quality equipment that they are selling.